Does this happen to you? No matter how carefully you fold and pack your clothes, they still come out of the suitcase looking less than presentable. While most of us today travel with wash-n-wear clothes, not everyone can afford to travel with a scrunched up wardrobe. Especially if you are on business, or need to look great when you arrive at your destination. This is where carry-on garment bags can save your clothes, and your trip from disaster. The following are some of the best options out there to help you carry your best clothes or suits on your next trip. Ranging from bi-folds, tri-folds through wheeled-bags, there is lots of choice. What's the best Carry On Garmet Bag for you? 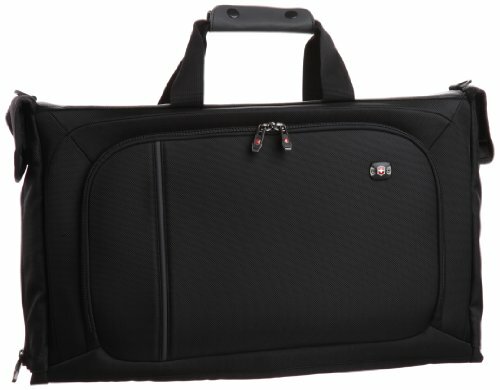 Most garment bags you will find are made with a horizontal build, which makes the Briggs & Riley garment bag unusual. The upright build is extremely useful, however, when you're rolling your bag through the plane aisles and avoid hitting the seats. This is, after all, a post about carry-on bags. There are two compartments that both open clam-shell style. The front compartment holds the suits and features a tri-fold panel with restraining side panels to keep your suit in place. It can fit up to two suits (or three for the ladies). There is a wally clamp to hold your own wire hangers. There are two removable zipped mesh pockets in the corners, good for underwear, socks and a belt. The main compartment has space for other items and clothing. It can also be opened while in the upright position. Side gusset straps keep the front section from opening all the way and spilling your items. A pair of adjustable restraining panels with two small mesh pockets built in keep all your clothes from falling out if you open this compartment while the case is upright. Half of the lid of this compartment features a zipped mesh pocket for soiled garments and the other half features two elastic top slip pockets for shoes. If you still need more space, there are two more pockets on the outside of the bag. It also has a Smartlink strap that you can attach to another wheeled bag if needed. The upright position makes the spacing awkward with the garment bag. It takes a little bit of getting used to before you learn to maximize the space well. Samsonite is well-known for its durable and long-wearing luggage products, so this is one of the most popular garment bags in the market. 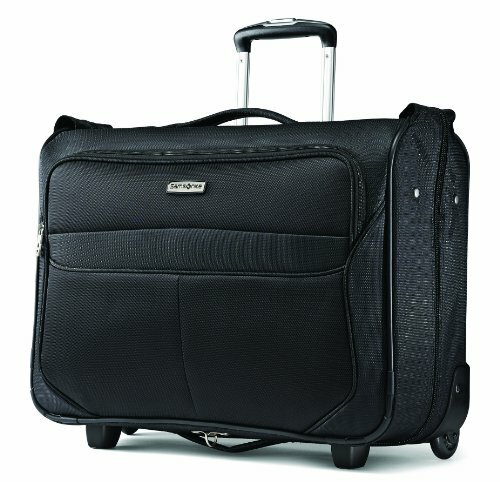 The Samsonite Luggage Lift Garment Bag is 100% polyester for a water-resistant finish. It measures 21 x 17 x 9 inches, which is beyond the size restrictions of some airlines. Many have claimed, however, that they have never had a problem with this, and the bag will still fit in the overhead bins. 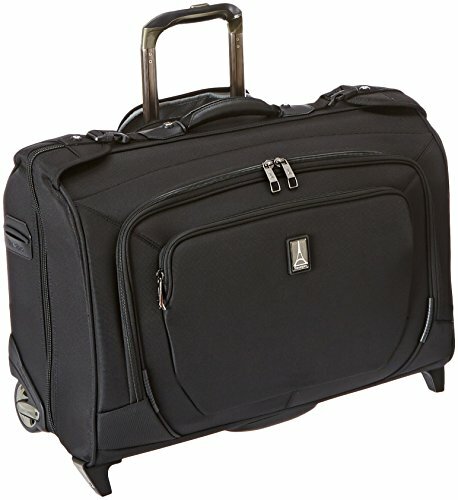 At 8.5 lbs, this is also one of the lighter wheeled garment bags you will find. With these dimensions, it can be a bit awkward. It's too big for ultra-light travelers, and too small for heavy packers. A full zippered panel opens up to reveal the main compartment of the bag. The top part holds a hanger hook. There are zippered mesh corner pockets on either side for smaller items or accessories. Compression straps keep your clothes in place. The bottom part of this compartment holds two zippered pockets. One is a wet/dry pocket while the other is mesh. This panel is attached to the sides with a snap, and can be unsnapped and unfolded to become an extender panel. ​The extender panel supports longer clothing items and held together with another pair of compression straps. While the entire bag may be smaller in dimension, it can be expandable to accommodate more clothes.​ There is also a zippered outer pocket to store a rain jacket or other last minute items. The bag has a grab handle on the top and a grab handle on the bottom for hauling the bag. It has a lightweight telescopic handle for rolling the bag. If you're a heavy traveler, it's always good to invest in sturdy luggage that will last your for a long time. That doesn't mean, however, that good products are always expensive. The Zegur Garment Bag is a steal at often very lost prices, especially for the quality and organization you get with just this one bag. Another sleek and slim design, this bag will fit in any overhead bin at 23 x 22 x 4 inches. Again, make sure to check your airline restrictions on size limitations as the dimensions of this bag is not standard for all. But, it weighs a mere 2 lbs. The dual-fold bag has several internal zippers and pockets to keep everything organized. It maximizes storage capacity for the interior of the bag, and expands storage options with a big external pocket big enough for folders and electronics. A cloth panel fully unzips to reveal the garment compartment. It has a hook at the top for the hangers, with three dual-buckle straps to keep the garments in place and wrinkle-free. Because there are no thick materials for the interior, the bag is flexible enough to hold up to three suits. If it doesn't fit your travel needs, they offer 100% money-back guarantee.​ Even better is the bag is made of 1800D Polyester making it sturdy and waterproof. This bag is very well thought out. A non-wheeled option is great if you need to watch out for weight limits for carry-on baggage. The Victorinox Luggage Werks Traveler 4.0 is a mere 3.2 lbs., leaving you with enough weight for your actual garments. Portability is one of the key advantages of this bag. There's a removable padded shoulder strap for hands-free travel, the top handle that can be held together with snap closures, and a back strap you can slip onto a telescopic luggage handle. This back strap is zippered so you can convert it to a pocket. There are so many options, it's hard to keep count. The main ilk in this bag is you won't be able to complete your look because there are no spaces to keep your shoes. While it's possible to fit those in, you'll have to have your own pouch or carrier for it (or throw them in your other luggage). The space above the shoulders of the garment is also not easily utilized with the lack of corner pockets. The "10" in this bag means it's on its 10th version, which means there are many aspects and features of a carry-on garment bag that they've perfected. 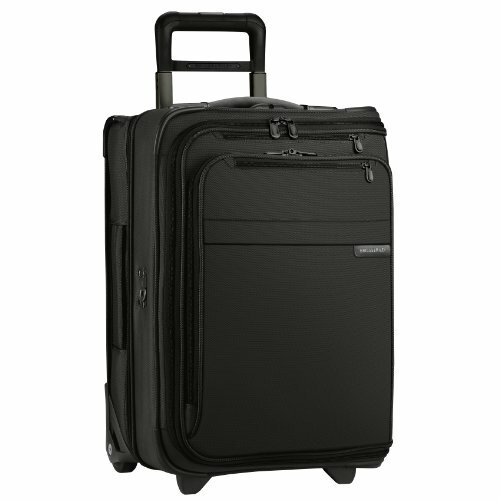 The Travelpro Crew 10 Garment Bag ​is one of the most stable wheeled bag out there. Its Powerscope telescopic handle is designed for comfort and minimizes wobble while on the move. It also locks mid-way so travelers of different heights can use this bag comfortably. Much thought has also been put in the material. It is 100% nylon with protective Dura guard coating for water resistance. The interior is treated with waterproof coating to keep all your garments safe. It's also treated with Duraflex technology, making the bag almost indestructible and impossible to break into. There are two external pockets for small items or jackets and documents. The main compartment has a metal hanger clamp at the top, in between two removable mesh pockets for small items and accessories. There are adjustable hold-down clamps and a foam-padded roll bar to keep suits in place and wrinkle-free. An extension panel also folds out of the bag for longer garments. In general, garment bags are not meant to be carry-on. Make sure you pay extra attention to the size of your bag and the size restrictions of the airline. The most common size limit for a carry-on is 22 x 14 x 9 Inches, so this is a safe bet. Some airlines will allow a bigger bag by an inch or two, but if you tend to fly with different airlines, better stick to the general size. There are bi-folds, tri-folds, and wheeled bags. While these garment bags mainly keep everything wrinkle-free, it's still up to your personal preference. The non-wheeled bags are usually handy if you don't want to unpack and just hang the garment bag right away. They are also considerably lighter, which will come in handy especially on budget airlines. The wheeled bags will give you a bit more space and comfort since you don't have to carry it around. Depending on what kind of packer you are, there are bags with many pockets to maximize storage space, while there are some that have minimal extra features to keep things light and sleek. Some bags are also treated to be water-resistant, which is important if you really want to keep your suits protected (other than being wrinkle-free). The garment bag for you depends on where you usually go. A big differentiating factor for these bags are the size and weight measurements. It also depends on how many suits you're supposed to carry. Frequent flyers and international travelers will never go wrong with the Travelpro Crew 10 Garment Bag. It's beyond sturdy and secure. You can bring this as a carry-on or toss it in with checked luggage without a problem. It also has more than enough space for your suits or formal wear plus extra clothing that are not as sensitive. 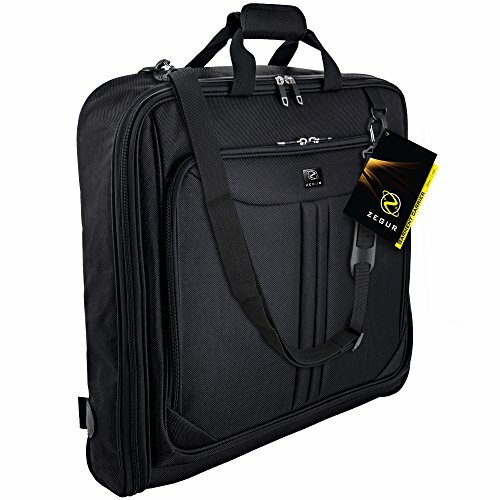 A great affordable purchase is the Zegur Garment Bag. It's a lesser known brand but delivers the same quality and performance. It's also one of the most lightweight bags, which will save you from paying excess baggage on budget airlines.